The rock above is part of one of the most significant rock outcrops in Oman. This is the internationally renowned Samail Ophiolite. The story of the ‘landing’ of the Samail Ophiolite along Oman’s northern coastline began around 90 million years ago when a several kilometre thick slab of oceanic crust started to be slowly pushed over the top of Oman’s beachfronts. This unusual overthrusting or obduction of the sea floor occurred as a result of an initial spreading apart of the Arabian and Eurasian crustal plates, which commenced around 270 million years ago in an ocean called the Tethys to the north of Oman. As the plates separated, the underlying mantle melted and pools of molten rock (magma chambers) welled up to fill the gap, then hardened to form new oceanic crust. Around 90 million years ago the plates started to converge. Normally under these circumstances, the heavier oceanic crust will slide beneath the continental crust. However in this case, the opposite occurred and for the next 20 million years, rocks originating from deep within the ocean were pushed hundreds of kilometres from the deep ocean floor onto Oman’s crustal plate. 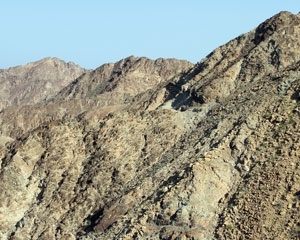 The rugged ophiolite hills around Muscat and those stretching hundreds of kilometres inland is the largest and best exposed fragment of oceanic lithosphere found on land in the world. (500 km long and up to 80 km wide). The ophiolite contains many valuable minerals including copper, manganese and chromite. The copper was mined from this source as early as 5,000 years ago, at which time Oman, then known as Magan, was exporting copper to Mesopotamia for use in the manufacture of bronze. Today, large amounts of slag, and other evidence of early smelting processes, can be found in numerous locations in the ophiolite region.